In June this year, a painting by Pablo Picasso arrived in Ramallah, where it was exhibited for one month at the International Academy of Art Palestine. Picasso's 1943 Buste de Femme, on loan from the Van Abbemuseum in Eindhoven, the Netherlands, and estimated to be worth $7 million, arrived in the West Bank after two years of negotiations. Once installed in Ramallah, it caught the attention of the world's media and was lauded as an instance of art's ability to transcend international and local political difficulties. 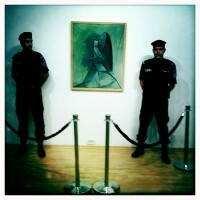 The images that accompanied reports of the exhibition in the international media inevitably showed the painting flanked by two armed security guards. As such, the painting was always framed within the context of the Palestinian situation, one that necessarily entails security and surveillance. Artist Yazan Khalili's text is a first-person account of one man's audacious theft of the painting from its heavily-guarded viewing space, and questions whether the work could be appreciated in its own right when the political implications of its display were as, if not more, visible than the work itself.